In case you didn't know, tomorrow is IPA Day around the globe. Wherever you may be, maybe you'd like to join in by just having a nice IPA at home, or, if you're lucky enough, at your local pub. Well, I am glad to say that our local Gahan House is taking part. They plan to have six variations of the style on tap at the pub tomorrow (starting at 7:00), and you can try all six for $7. Plus, you can fill out your comments / notes on each on a card, to see what the best beers of the night were. 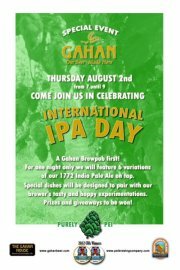 Your card could also win you a 19L keg of Gahan's own 1772 IPA some PEI Brewing Company swag at the end of the night. I know where I'll be tomorrow - how 'bout you? I'll be there. Is it pay at the door or do you need tickets? Pretty sure it's just pay for your drinks like normal.